Well it has been a while since my last post. There has been many a well intentioned evening where I planned to write an update, but which ended in me in bed by 9pm (which is known as missionary midnight). Should I be so bold to say that I will be blogging regularly again (new years res?). Maybe. 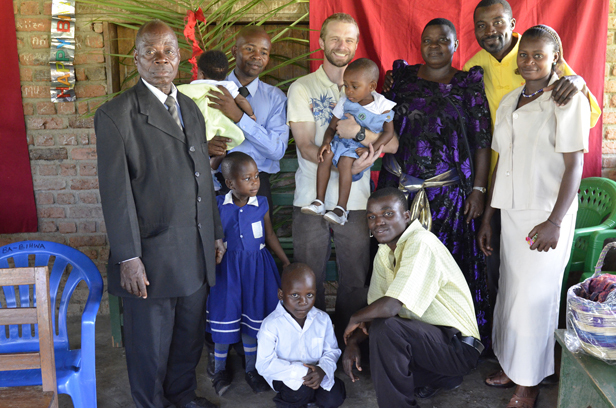 God has been incredibly faithful in these first 3 months back in bundibugyo. The old GFS water system near where I live is in an constant state of needing repair. It has been easy to get frustrated when it feels that my time is completely spent on temporary repairs as opposed to longterm solutions. But seeing the taps flow again and children and women collecting water warms my heart. As challenges have come, God has given me double measures of patience and I am often reminded again of His calling on my life here and during temporary setbacks His refreshments lift the burdens of life here off of my shoulders. One of the exciting events in Bundibugyo is the roadwork going on - they are paving the road all the way from Ft. Portal to Nyahuka where I live (crazy exciting as it should drop the 3-3.5 hr transit time to the next biggest city down to an hr and a half!)﻿. One of the downsides is that the large construction trucks broke one of the main road crossings for the town center of Nyahuka. How can you be praying for the water project? Prayer is desperately needed for developing sustainable operating and management practices for the already built water projects. Currently water projects operate well for a few years until they slowly start to fall into cascading levels of disrepair. Teaching and empowering the community to repair, maintain and fund these activities is one of the greatest and hardest tasks in front of me. Right now, leaks are either repaired by outside funding or the system just stops working and people begin collecting water again from the streams (dangerous!). And sometimes life gives you the most wonderful pictures. We went Christmas caroling around our "neighborhood" and everyone loved it! And were willing to pose for a quick picture! Sometimes cultural differences give you something unexpected. I went to give this little buddy a five and he just held my hand. Love it! I have been blessed with good friendships here in Bundibugyo. This was a snap from Topi's birthday (she's in the purple) and is married to Bhiwa who is one of my best friends here. He's been helping me with language learning and has had me over several times to eat with them (he always jokes with me that its the mosumba's legs that feed him - mosumba means bachelor). I am thankful to God for each day that I have been here and for the days to come.